April's Book of the Month comes highly recommended by good friend and business partner Mr Jason Ching. For the past two years Jason has been on a fast track journey of personal development voraciously devouring book after book in his quest for growth. His thirst to be better has opened him up to a whole world of discovery and has lead him on a continual exploration of books and material that has helped not only himself and his family but has impacted the lives of the hundreds upon hundreds of people he mentors. So when Jason gets excited about a book, I get it immediately. 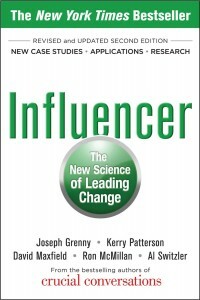 I'm excited to start digging into April's Book of the Month: INFLUENCER: The New Science of Leading Change.